As the weather changes and you want to liven up your wardrobes, your hair, your makeup and your nail looks, I have found a few nail colors and cool wraps for you to try that will hopefully make the transition between the seasons an even brighter one! Both wraps are by NCLA and are priced at $16. I can see these wraps in their fun styes looking so great that you can just wear a bright solid color outfit and let the nails be the highlight. 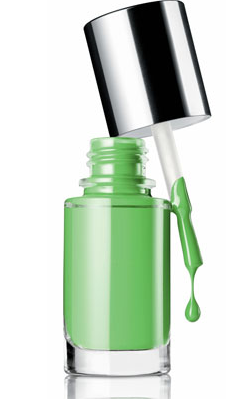 The awesome green color is by Clinique is a limited edition color, by the name of Hula skirt. It's price is also $16. Aeropastale wants to save the day of the little ladies and those that like lighter, classic hues with a dash of glitter. They are offering their 5 bottle mini polish set for $5.60. And if you would like to handle all of your spring and summer nail polish needs in one WHOP, then you can buy Deborah Lippmann's 5 bottle mini polish neon set for $30. Be aware of nail polishes and their costs when you visit your local drug stores and boutiques or shops. If you see any hot spring or summer colors at a reasonable price, I would have to recommend that you buy them! !